TBILISI, DFWatch–A protest against terrorism was held on Sunday in Tbilisi and several other towns in Georgia to show support for the refugees persecuted by Islamic State. A call went out on Facebook a few days in advance for people to meet outside the old parliament building in Tbilisi. 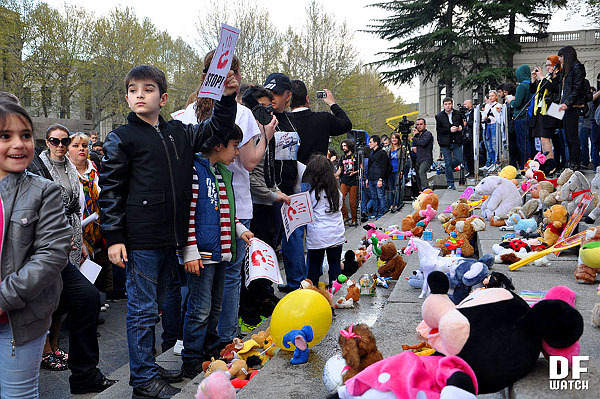 Hundreds of people showed up, bringing with them posters reading ‘STOP’, some carrying toys which will be distributed to children’s shelters in Georgia. “We don’t want a world with toys but without children,” one of the participants at the rally said in an appeal to the others there. Other speakers said that the terrorism doesn’t have a religion and expressed solidarity with everyone who is persecuted by terrorism. “No politics, no affiliation. I came here to fulfill my duty as a human. I hope no political forces are willing to use this issue for own interests,” Kote, one of the rally participants, told us. Giorgi Lomsadze, one of the organizers of the rally, said those who planned the rally are apolitical people and only one idea is common for everyone who came, which is to protest against terrorism. “Terrorists kill women, children in Syria, Iraq and Egypt. We, youth, friends united against it. It is apolitical and non-religious rally,” he said. There were spotted a few Armenian flags among participants. Armenians commemorate the genocide which started one hundred years ago on April 24, but Georgia has not recognized. 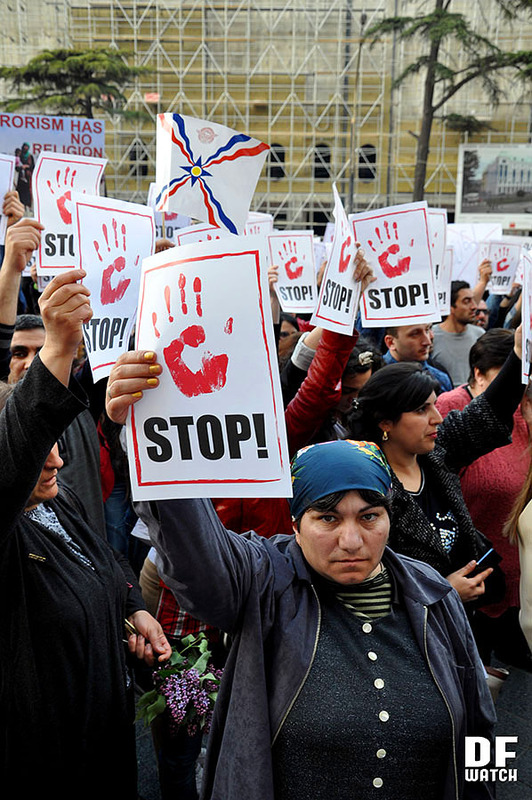 Another goal of the rally was to ask the Georgian government to grant asylum to Assyrian refugees. Sunday Catholicos Patriarch of Georgia, Ilia II, conducted prayer for peace in Syria, Iraq, Georgia and for the world, also to pay tribute for the victims, Orthodox Christians, in Syria and Iraq. A priest of Assyrians living in Georgia, Serapife, also participated in the prayer.